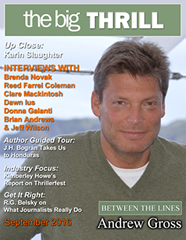 Read the stories that were in the September edition of the Big Thrill. The September issue showcases writers who tackle topics of real meaning. Yes, these books are page-turners, and they’re written with depth and heart too. Andrew Gross, our cover story, talks about what path he followed that led to The One Man, his thriller set in World War II. Karin Slaughter talks about The Kept Woman and how humor helps when she must travel to dark places of the soul. Other must-reads: Brenda Novak, Reed Farrel Coleman, Clare Mackintosh, and the trio of Tim O’Mara, Charles Salzberg and Ross Klavan on their book of crime-fiction novellas. Plus, Dawn Ius on her young adult car-heist thriller and Donna Galanti on her middle grade suspense adventure. 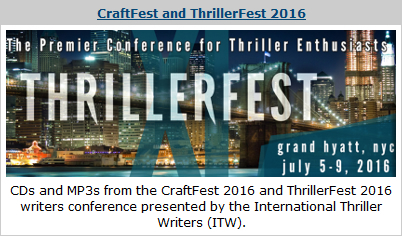 It’s one of our favorite times of year: Kimberley Howe’s report on ThrillerFest 2016, so we can relive the high points! Another story related to Thrillerfest: our interview with hot military-thriller team Brian Andrews and Jeff Wilson, who met as debuts at the ITW conference in 2012. Other compelling interviews in the issue: Wendy Walker, Sally Andrew, Grant McKenzie, Paul Kemprecos and more. 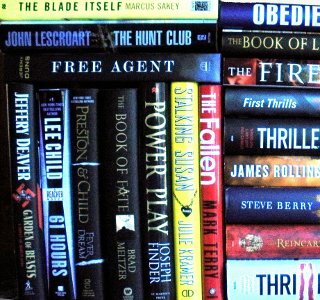 The latest thrillers from Allen Eskens, R.G. Belsky, Jon Land, Alex Kava, Charlaine Harris, Robert Dugoni, Diane Capri, Christina Hoag, Leslie Budewitz, Mary SanGiovanni and many more! From Steve Berry to Heather Graham to Meg Gardiner to David Corbett to Jane Stine and many others, we’ve got it all. Learn from the masters while customizing your learning experience. You pick and choose which session(s) you want and only buy what you want. And don’t forget to stay tuned here. Registration for next year’s conference will be open in this month. It’s going to be another great one. We hope to see you there! Check out what’s in store for September. It’s going to be a thriller! Congratulations to Amy Strauch, the winner of this month’s BIG THRILL giveaway. Amy will receive an assortment of signed thrillers including Air Time by Hank Phillippi Ryan, The Ninja’s Daughter by Susan Spann, Swann Songs by Arlene Kay, Field of Graves by J.T. 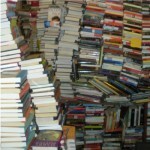 Ellison, Tag, You’re Dead by J.C. Lane, Lowcountry Book Club by Susan M. Boyer and Ice Station Nautilus by Rick Campbell. All subscribers to The Big Thrill webzine are automatically eligible for the monthly drawing. CLICK HERE to subscribe to The Big Thrill.